The northern suburbs from Melville Koppies Central. Emmarentia Dam is in the middle distance. Two names are entwined with the history of Melville Koppies: Braamfontein and Geldenhuys. Stand on the ridge at the Lecture Hut and look north. There is a wonderful view of Johannesburg's northern suburbs. To the east is Westcliff, behind it Parktown. Northeast are the large white buildings of commercial Rosebank. Beyond Emmarentia Dam in the middle ground is Parkhurst. Northwest the rectangular streets and avenues of Linden stand out. A little further left is the large open space of Alberts Farm sloping up to Aasvoelkop To complete the picture, west behind the trees is a tall building, the police married quarters, and due south over the ridge is Melville. They roughly mark the boundaries of what was Braamfontein farm. The early missionaries, hunters and traders exploring the country across the Vaal River used the Missionaries Road to Kuruman, far west of today's Witwatersrand, where the going was easier. Even those who turned east closely followed the southern side of the Magaliesberg to the Hartebeespoort. After 1827 Mzilikatsi was a further deterrent. Fleeing Shaka's wrath, he had eventually settled on the northern slopes of the Magaliesberg. His impis cleared the country of people down to and across the Vaal. They attacked hunting parties and attacked the main body of trekkers at Vegkop in 1836 and forced them to retire to Thaba Bosigo. In the following year Potgieter organised a commando that drove Mzilikatsi into the Western Transvaal from where a second commando forced him across the Limpopo. Even then the country remained very sparsely settled until the British annexations of Natal in 1843 and of Transorangia in 1848 sent further waves of trekkers across the Vaal. Among them was Gerrit Bezuidenhout (1822-1876), originally from the Beaufort District, who in 1851 applied for and in 1858 was granted title to the farm Braamfontein. The name is derived from a spring - possibly the Braamfontein Spruit - that flowed out from a dense patch of brambles (indigenous Rubus rigudus). It was a very large farm (1 500 morgen or 3 500ha) in the Central Witwatersrand and which included Melville Koppies. On receiving title he transferred the farm the next day to his brother F.J.Bezuidenhout. In 1862 F.J.Bezuidenhout subdivided the farm into three parts of about 500 morgen each. 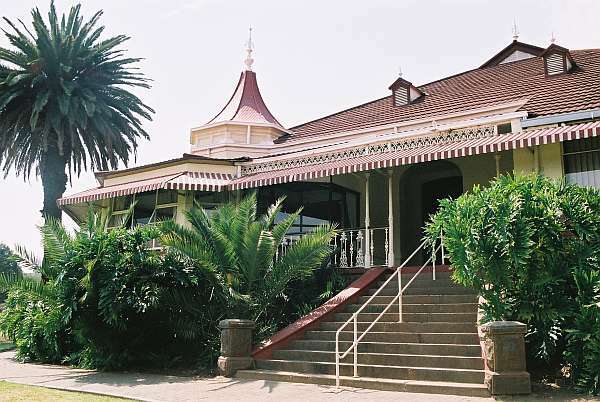 The southern portion was returned to G.P.Bezuidenhout who sold it in 1871 and after passing through several hands was in 1887 bought by the Zuid Afrikaansche Republiek Government for 4000 Pounds. The ground was eventually used for the hospital, fort, market, tramsheds, power station, the brickfields (later the railway yards), the Brixton and Braamfontein Cemeteries, the university, showground, gasworks and, most recently, the Civic Centre. The eastern part, again after several owners, was in 1886 bought by Dirk Geldenhuys for about 4 000 Pounds. He leased part to Edward Lippert, who planted the Sachsenwald - anglicised during the 1914/18 War to Saxonwold - for pit props. The rest was leased to the Braamfontein Estate Company that later donated the Zoo and Zoo Lake to Johannesburg in memory of Hermann Ekstein, a former director, for his services to Johannesburg. A few years later Louw Geldenhuys, Dirk's brother, (the sons appear to have acted as agents for their father, Lourens) sold the eastern portion to the Braamfontein Estate Company for 300 000 Pounds. The buyer was Lippert, who had paid for a share of the company with his Sachsenwald. The wheeling and dealing in property and its escalation in value was typical of goldrush growth. Johannesburg's population grew from about 2000 in 1885 to 100 000 in 1895. A blast hole on Melville Koppies Central. The evidence we have seems to show that the prospecting here was rather half-hearted. When further prospecting was unsuccessful, the company sold the ground for townships. At this early stage of Johannesburg, the social stratification found in most cities appeared. For the wealthy, Rosebank, Westcliff, Parktown and Forest Town were laid out on the high ground in large stands, where no shops were allowed. On the lower ground were Parktown North, Parkview and later Parkwood with smaller stands and shops for the middle class, while the working class lived in the south in Turffontein and Rosettenville in the smallest stands among the mines and factories. A pattern that was to become common for most South African towns also appeared. In contrast with Europe where the poorest lived in the oldest buildings in the centre of towns, the poorest, mainly non-white, people lived beyond the brickfields on the outskirts of the town. The western portion of the farm passed to C.W.Bezuidenhout and was then bought in 1887 by Frans and Louw Geldenhuys for 4 500Pounds. An old map of the original farms. Someone has marked the "Uitvalgrond" rather roughly. The extent of the original farm can be traced from the boundaries of the townships formed from it. The northern boundaries of Victory Park (Road No. 5), Parkhurst (22nd.Street), Parktown North (Sutherland Avenue), Rosebank (Rosebank Road) mark its northern limits. From Rosebank Road the eastern boundary continues down Oxford Road, along the western boundaries of Killarney and the Wilds to the beacon marking the northern tip of the ‘Uitvalgrond'. The ‘Uitvalgrond'was a triangular piece of unclaimed land between adjacent farms and in which were laid out the first streets of Johannesburg that now form the city centre. The eastern boundary continues down the western side of the Uitvalgrond (Clarendon Place and Diagonal Street to Commissioner Street). The southern boundary follows the northern boundaries of Fordsburg, Mayfair, Mayfair West and Crosby (Queens, Bartlett and High Streets), Coronationville and into Westbury. From here the western boundary cuts north along the Westdene / Sophiatown boundary, the eastern side of St. Josephs Orphanage, across the ridge and Westpark Cemetery, through a corner of Linden (13th. Street) to the western boundary of Victory Park (Leighton Road). It is more difficult to trace the boundaries of the subdivisions. Township boundaries are generally along streets, but in some cases a neighbouring stream would seem to be more appropriate. The northern boundary of the southern portion appears to run from Clarendon Place, westwards along Empire Road (roughly following the Braamfontein Spruit), along the southern boundary of Melville (St. Swithins Road to Perth Road), along the eastern boundary of Westdene (Perth Road) and the western boundary of Hurst Hill (Harmony Street) to meet the farm's southern boundary. The boundary between the eastern and western parts runs down 1st.Avenue West between Parkhurst and Parktown North to where it meets the Braamfontein Spruit then down the Spruit to Empire road. The further subdivision of the western portion between the brothers Frans and Louw Geldenhuys in 1891 starts at the northern boundary of Melville, which had been sold by then. It continues northwards along the eastern boundary of the nature reserve, Orange Road, then across Emmarentia Dam, possibly along the Braamfontein Spruit between Parkhurst and Victory Park to the farm's northern boundary. Davis had found gold at Paardekraal as early as 1852, Pieter Marais in the Jukskei River in 1853 and others thereafter from Heidelberg to Sterkfontein, but all in small alluvial pockets or small lenses in quartz veins, none payable. The Z.A.R. government itself, very conscious of the difficulties experienced at Barberton, banned all prospecting on the Witwatersrand. (This did not seem to apply to farms north of the ridge like Braamfontein). However realising the difference the discovery of gold could make to its depleted treasury, it appointed Peter Marais as the official prospector, but nothing came of it. The government also passed a series of laws regularising the purchase of farms and mining rights to provide some protection to landowners. Nevertheless there was a growing conviction among prospectors and some landowners that there were rich deposits of gold somewhere on the Witwatersrand. On the other hand judging from the low prices for which landowners sold their farms or mining rights, many were sceptical or did not appreciate the immense wealth the discovery of a gold reef would bring or were uninterested. When gold was discovered and fortunes made it heightened the general resentment of ‘Uitlanders', which would bedevil South African politics for a century to come. 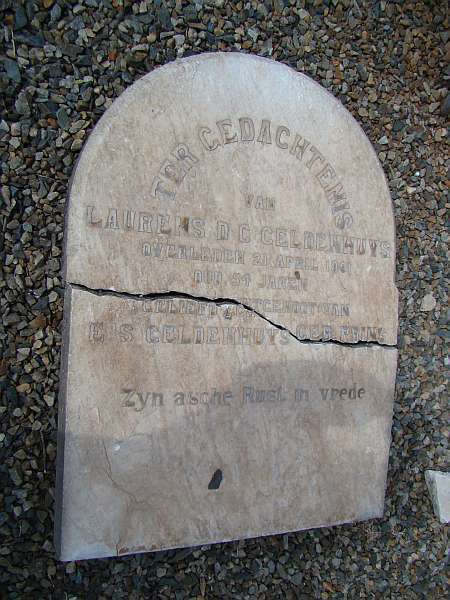 The grave of Lourens D C Geldenhuys in the Geldenhuys family graveyard in Emmarentia. Notice that although the name "Lourens" or "Laurens" - or just "Louw" was traditional in the Geldenhuys family, the spelling varied. An exception was Lourens Dirk Cornelius Geldenhuys (1836-1891) from Swellendam (his family originally came to the Cape from Germany in 1650) who with his sons, Frans (1856-1934), Dirk (1858- ) and Louw (1864-1929) settled at Kliprivier near Heidelberg in 1853. Although a landowner and a member of the strict and conservative Dopper Church, he actively sought the rich gold deposits he believed were somewhere on the Witwatersrand and he appeared to have a feel for its geology. 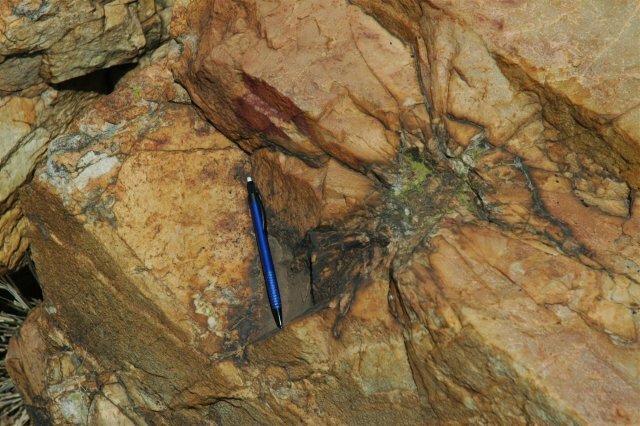 Lourens had visited Barberton and would have become acquainted with the current theory on gold, namely that it would be found associated with quartz intrusions. In 1875 he bought half the southern part of Wilgespruit on the West Rand. Gold was found there in 1876 and in 1882 he formed the General Prospecting and Mining Company of Burgers of the Z.A.R. but it came to nothing. When in 1884 he learnt Fred Struben was prospecting the area he took him on a tour of the western Witwatersrand, including Kromdraai, (later opened as a public digging) and Sterkfontein. They found gold, but nowhere in payable deposits, until they returned to Wilgespruit. Here. Struben found promising values in a quartz band, which he named the Confidence Reef. He bought the farm from Lourens and, with a loan from the Z.A.R. government, set up a stamp battery the following year, but the values petered out and the mine was closed after a year. Lourens,expecting the Confidence Reef to extend eastwards, bought a ‘mynpacht' for 4 500 Pounds on the western portion of Braamfontein, whose many white quartz outcrops looked promising. The ‘mynpacht' gave him the right to prospect and mine for minerals and buy as much of the farm as was needed for mining operations. Lourens exercised his option and the traces of his three sons' prospecting- adits (clefts in the rocks), broken rock with blast marks and a platform, on which stood a blacksmith's forge for sharpening tools- are still visible in the nature reserve. Not finding payable gold, the Geldenhuyses went further east to the farms Elandsfontein Nos.1 and 2 in today's Bedford View and Alberton. In 1886 Kruger, petitioned by landowners and prospectors to lift the ban on prospecting, set up a commission to report on the matter. Frans attended as the owner of Elandsfontein and Braamfontein and Dirk as a lessee of part of Langlaagte. On the commission's recommendation Kruger declared seven Witwatersrand farms (among which was Elandsfontein) public diggings. Shortly after Harrison discovered the Main Reef, the Geldenhuys' located it on Elandsfontein and floated the Geldenhuys Estates Gold Mining Company, which was later sold to the Corner House Group. The family then separated. Lourens remained on his estate on Elandsfontein, now Bedfordview, from time to time selling portions at great profit. His sons fulfilled the ambition of young Afrikaners of the period. Dirk went farming at Ermelo and Frans and Louw took over the western part of Braamfontein. Although on the outskirts of rapidly growing Johannesburg , profitable farming was not easy. Apart from booms and busts in the share market, which influenced spending and droughts, there was no established market, which meant hawking produce from door to door or camping several days beside a popular thoroughfare. Louw Geldenhuys's house in Greenhill Road. The palms are as old as the house. 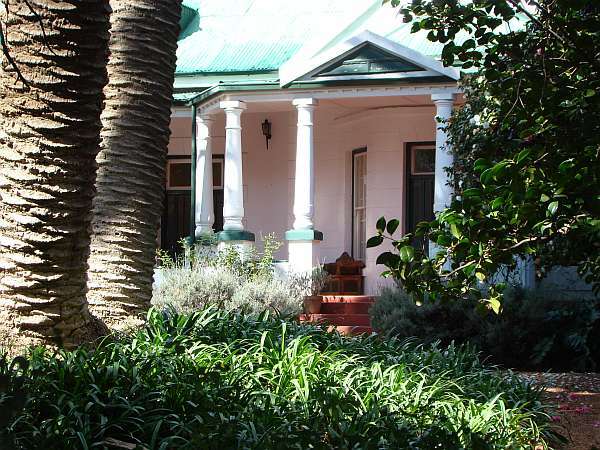 Louw married Emmarentia Botha in 1887 and named his farm after her and built her a palatial farmhouse from the wealth provided by the Elandsfontein mine. 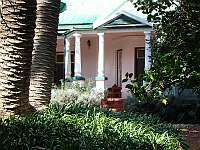 The house still exists as a National Heritage Site at 14 Greenhill Road as does the family cemetery in Hill Road behind Louw's house. 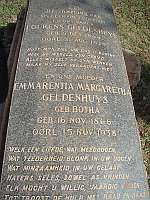 The number of children's graves is a poignant reminder of the level of medical knowledge and hygiene of that time (The Geldenhuys family was wealthy yet of Emmarentia's 15 children only 8 survived to adulthood). In 1886 Lourens sold the most southern valleys and ridges to the Auckland Park Estate Company. After Lourens' estate was distributed in 1891, Frans and Louw registered the subdivision of their farm, each having about 228 morgen, the boundary being the present Orange Road then northwards probably along the Braamfontein Spruit. Servitudes were written into the Title Deeds, which guaranteed each a half of the water that still flows perennially from the Westdene Dam. The stream enters the reserve at the head of the Frans Geldenhuys Kloof and, after being joined by another stream from Melville, flows under Beyers Naude Drive. It leaves the reserve again under Judith Road and continues down to Emmarentia Dam. It was probably at this time that the water pipes just above the Old Mulders Drift Road were laid. In 1895 both Frans and Louw added to their farms by buying parts of the neighbouring farm, Waterval possibly to safeguard springs, which irrigated their farms. The following year they sold the ground on which Melville and Richmond are built as small holdings. In 1898 Louw, possibly forseeing the time he would sell Emmarentia to developers, bought the farm Honingklip of 3000 morgan near Krugersdorp for 4012 Pounds. His descendants still farm there and have renamed it Laurentia. Little is known about Frans, but Louw, eight years his junior, was soon a public figure, highly respected for his knowledge of mining and mining law and business acumen. In 1895 he was elected to represent the Witwatersrand in the Tweede Volksraad which dealt with finance and mines. He was defeated in the 1899 election before the war because he opposed the sale of liquor to non-whites, but nevertheless was brought into the committee that discussed the ultimatum to the British. This is remarkable for a young man in his early thirties in a conservative society where experience garnered with age carries most weight. Louw and Frans went to the Natal Front with the Krugersdorp Commando, but surrendered when the British took Pretoria in 1900 and Kruger went into exile. Frans Geldenhuys's house is now the clubhouse of Marks Park Sports Club. Note the trademark Geldenhuys palm trees. Although the war was to continue for another two years, when the British took over Johannesburg their aim was to bring the town and the mines back to life as quickly as possible. One of their first acts was to issue certificates of title to landowners. Frans and Louw obtained theirs in 1901, which allowed them to undertake transactions in land. Frans and van der Linde laid out Linden the same year. In 1903 Frans sold the Western Ridge and the ground for Westdene for 30 000 Pounds and Louw the ground for Parkhurst. Louw had his farm laid out as a township, excluding the koppie behind his house, which he loved. But then he changed his mind. This was the time that Frans built his farmhouse for his wife Judith Grobbelaar and which is now the Marks Park clubhouse. Like all who have experienced war, Louw was profoundly affected by it. Unlike many others he did not become bitter, but instead acquired a deep compassion for those who had suffered from it. He and his wife became a byword for their generosity to individuals and institutions. 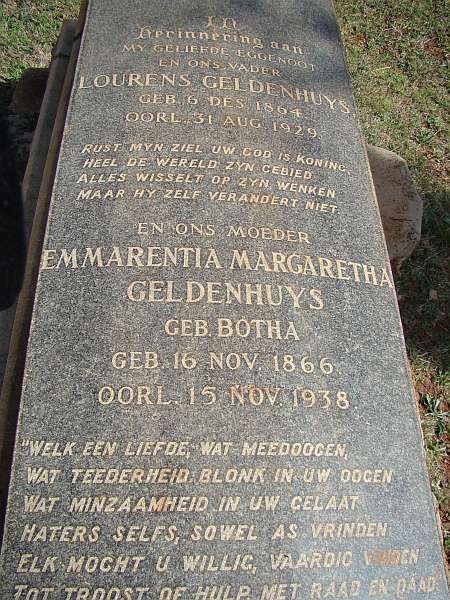 The grave of Louw and Emmarentia in the Geldenhuys family graveyard. In 1902 he founded and thereafter supported the Langlaagte Kindertehuis, and the Braamfontein Government School, which held classes in a barn behind his house until some years later when it was transferred to Linden and became the Louw Geldenhuys School. His greatest work was to build Emmarentia Dam to give work to young Afrikaner farmers who had lost their farms and then to put 100 of them to make a living on small holdings where Emmarentia and Greenside now stand. He did not charge them rent, but applied the “metayer” system whereby they paid him a third of their profits. The farm was transformed into stately avenues between orchards and fields of vegetables and pasture. They were never short of water as they were irrigated from Emmarentia Dam or from another dam higher up the ridge to where water was pumped by a steam pump. It was possibly the beauty of this scene that held Louw back from selling his farm. Louw entered politics probably for the same motive-to better people's lives. As a politician he was polite and quiet-spoken even in a heated debate and he had a wider vision than most. He was concerned about the sale of liquor, particularly to non-whites, supported the franchise for women and strongly championed General Botha's policy of reconciling the Afrikaans and English-speaking sections. He was a member of the City Council for many years. In 1910 he was elected to Parliament as the member for Vrededorp, from 1915 to 1929 as member for Johannesburg North. He even held his seat in 1924 during the landslide against General Smuts following the 1922 Miners' Strike. Louw died in 1929 and his family sold the farm to developers. Greenside was laid out in 1931,Emmarentia in 1937 and Emmarentia Extension which took houses to the very top of Louw's part of Melville Koppies in1945. In 1932/3 Frans donated the kloof through which the stream from Westdene Dam flows,the poort through which Beyers Naude Drive runs and a wetland, now RAU sportsfields, to the City Council for a park to be named the Frans Geldenhuis Park He died in 1934. 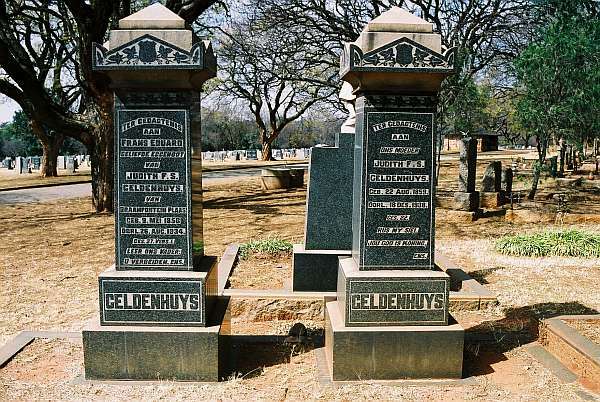 The graves of Frans and Judith Geldenhuys in Westpark cemetery. Much less well known than his brother, he died near what was then Louis Trichaardt, and was reinterred here. Judith Road is named for his wife. In 1943/4 the City Council bought most of the ground that had been Frans' farm from his heirs and others to whom portions had been sold. 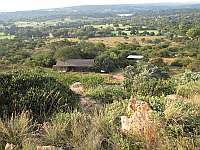 This included the western part of Melville Koppies and the Western Ridge above Westdene. This large open space was used for Westpark Cemetery, Marks Park and van Riebeeck Park (later the Johannesburg Botanic Garden). The Koppies itself was completely neglected. It was used as a dumping ground, plants, rocks and soil were stolen, vagrants camped there cutting down trees for firewood and bringing in litter and alien plants invaded it. 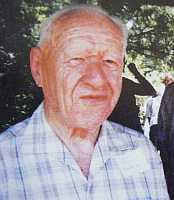 The late HJM ("Sporie") van Rensburg at the Melville Koppies AGM in 2006. In 1947 Councillor H.J.M.van Rensburg, alarmed by the building of houses on the eastern end of the Koppies (in Emmarentia Extension), started a campaign to turn what was left of the Koppies into a nature reserve. In 1950 the Director of Parks, Mr. J.C. van Balen, drew up plans for a botanic garden in van Riebeeck Park. The idea was to include Melville Koppies across Judith Road as it was recognised that despite the damage done to it, it still had a rich indigenous flora well worth preserving. When Mr. Van Balen retired in 1953, plans were shelved and Johannesburg missed a splendid opportunity. During 1957 it became increasingly clear that the Melville Koppies were in great danger and that something had to be done quickly to stop its destruction. Because of the tremendous educational potential of the area the campaign to preserve the Koppies was intensified and broadened. Full support was secured from the South African Association for the Advancement of Science, Wildlife Protection Society, Witwatersrand Bird Club, Geological Society, National Botanic Gardens of South Africa, Botanical Society, Transvaal Department of Nature Conservation, University of the Witwatersrand, Transvaal Horticultural Society, Tree society, Division of Botany in Pretoria and the Johannesburg Publicity Association. A strong press campaign was launched. 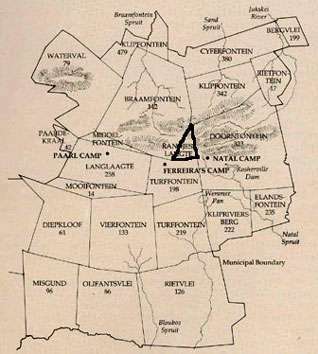 A delegation from these bodies headed by Professor Badenhuizen met the Public Amenities Committee of the Johannesburg City Council on 9/1/1958.. As a result of this pressure the City Council resolved on 25/2/58 to approach the Administrator for the proclamation of the area as a Native Flora Reserve in terms of the Native Flora Protection Ordinance of 1940. A provision for an amount of 1000 Pounds for fencing and 900 Pounds for supervision was to be considered in the 1958/59 Estimates. There were further delays and continuing degradation, but eventually the provisional fencing was completed, notices erected and the area proclaimed a Nature Reserve in February 1959. 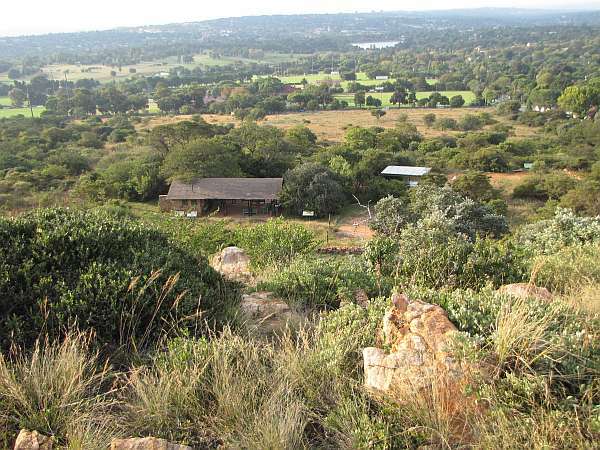 The Johannesburg Council for Natural History was inaugurated at the request of the City Council to advise the Council on the maintenance and use of nature reserves in the Johannesburg area. Councillor H.J.M.van Rensburg was elected Honorary President in appreciation of his active interest in Melville Koppies, dating back to 1947 and his commitment in 1957 when representing the Melville/Emmarentia ward in the City Council to getting the area proclaimed a nature reserve. J. D. Omer-Cooper, History of Southern Africa, 2nd. Edition, David Phillip Publishers(Pty), Cape Town 1994. Bulletin of S.A.Party, June 1929. Master Plan for the Conservation and Utilisation of the Melville Koppies Nature Reserve, Johannesburg, 28/6/1994,updated January 1998.